If you’re looking for an energy efficient toaster, you might not need to look any farther than your own kitchen counter. There are toasters that bill themselves as energy efficient, but the claims don’t really stand up to scrutiny, in my view. More on that below. For most households, the amount of energy a toaster uses over the course of a year is pretty miniscule. It might not even be as much as the energy it takes to manufacturer a new toaster (and transport the old one to the landfill). For instance, a 900 watt toaster used for four slices a day for a year consumes only about 20 kilowatt hours of electricity per year. If you switched a 100 watt incandescent bulb for a 25 watt CFL, on a fixture used 2 hours per day, you’d save 55 kwh per year, or nearly three times what the toaster consumes. So serious energy savers can toast their bread with a clear conscience, and focus on other energy saving activities. My advice to you in finding an energy efficient toaster is to look for a quality toaster with minimal bells and whistles. If you have bad toaster karma, as I do (two broken toasters in the last six months), you are better off looking for a very reliable toaster rather than the one that uses the least energy. Buying a new toaster every six months probably uses more energy (in manufacture of the new toaster, disposal of the old one, and transportation costs) than the toaster uses making toast over its useful life. Find a simple, dependable toaster – preferably one with a longer warranty period, or one that gets consistently high customer reviews – and you’ll save more money and energy, in the long run, than by looking for the most energy efficient toaster you can find. Extra long slots for home-baked or country-style bread can waste energy – the element is on for the entire length of the slot, even if the slices you are toasting are standard commercial loaf size. Four-slot toasters that don’t let you turn on only two slots at a time waste energy – if you need a four-slot toaster, look for one that lets you turn on only two slots at a time. Avoid toasters that come with LED indicators. LED lights use hardly any electricity at all, but if left on constantly, their usage does add up. For example, a 1-watt LED uses about 8 kwh if it’s on throughout an entire year – that’s almost half what a typical toaster uses to toast bread in a year! Empty slot detection. A slot that has nothing in it shouldn’t go on. Individual slot control. If your toaster doesn’t have empty slot detection, it should at least let you manually disable one slot in a two-slot toaster if you’re only toasting one slice. Covered top. Hot air rises, so if the toaster could be made to cover its top while toasting, less heat would escape from the top, and so less electricity would be required for the same toasting power. I talk more about this below. Insulated sides. The sides of some toasters can get quite hot. An energy efficient toaster would be well insulated on the sides so that this heat stays where it’s wanted – where it toasts the bread – instead of escaping to the outside. Does such a toaster exist? I haven’t found one. There are toasters that let you turn off unused slots, and toasters have varying degrees of insulation in them. Even the toaster I grew up with had words printed along the top: SINGLE SLICE IN THIS SLOT, although I don’t know how much energy that saved. And there is a toaster that covers the top while toasting to save energy, although I don’t buy that particular toaster’s claim to being energy efficient – I talk about that toaster at the bottom of the page. The toast and the eggs are ready at exactly the same time – and the eggs are done right. No need to cook a second set of eggs when you accidentally boil the first set to death! I admit, I’m stretching things by billing this product as an energy efficient toaster. But I was struck by how many people love this toaster, and I really don’t believe looking for an energy efficient toaster is that important. As I already mentioned, toasters don’t really use much energy, and there are many things you can do in your home that will have a far bigger impact on your energy consumption and your electricity bill. The Ecolectric toaster bills itself as an energy efficient toaster. It comes with an autoclose lid, which traps in heat while the bread is toasting. The manufacturers suggest that this saves up to 34% of the energy used to toast bread. Ecolectric toaster bills itself as an energy efficient toaster, but is it really? How much of a dent will this energy efficient toaster make on your annual electricity bill? First of all, note that the toaster, if left plugged in, does have a phantom or vampire load, because of an LED light that stays on continuously (didn’t I mention that above in the list of features to avoid?). The load is likely negligible, however, since most LED indicator lights have a load of less than 1/20 of a watt. Now let’s look at the toasting process. During toasting this toaster consumes about 1.1 kilowatts. That’s a little more than my 800 watt economy toaster, but the toasting should take less time because the autoclose lid on the toaster traps in heat. 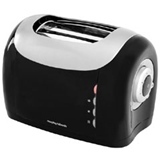 According to a review in REUK.co.uk, this toaster took 90 seconds to toast two slices of bread to ‘brown level 5’. That means 0.027 kWh for two slices of bread. How does this toaster compare with my lowly economy model? I did two tests (with my toaster, since I don’t own this energy efficient toaster yet): I toasted two slices of bread the usual way; then I toasted another two slices, with a metal cookie tray on top. Note the measurements in the right column are in Watt-hours – in other words, if you toasted two slices of bread 1,000 times this way, that’s how many kilowatt hours it would use. It looks like the Ecolectric scores lowest – but this is not a scientific comparison, as REUK did the tests with the energy efficient toaster using one kind of bread, and I used a different kind (probably much faster-toasting) in my experiments. But look at the savings I got with the covered test – 29% of the energy used in the uncovered toasting wasn’t used in the covered toasting, which means covering the toaster was 40% more efficient. So you can see that the Ecolectric energy efficient toaster is onto something with their covered top idea. Let’s give this toaster the benefit of the doubt and support its manufacturer’s efficiency claims. Assuming it is 34% more efficient, we’ll say the 26.5 Wh it took REUK to toast two slices of bread would have taken 40 Wh on an equivalent toaster without a cover. Now let’s assume your family toasts six slices of bread a day, six days a week (pancakes on Sunday!). That works out to 25 kWh per year for the energy efficient toaster, compared to 38 kWh for its hypothetical inefficient cousin. So you’ll save 13 kWh a year in this scenario. The sticker price is in the range of $50-60 US. So how does investing in an energy saving toaster compare with, for example, buying energy saving compact fluorescents or LED house lights? Let’s assume the lights in question are left on 2 hours a day every day, and are replacing a 100 watt incandescent light with an LED or CFL of the same light intensity. The ‘Leverage’ column indicates how many of that unit you could buy with $50 US. As you can see, the Ecolectric toaster will save you 12.85 kWh a year (assuming you unplug it when not in use). A similar investment in LED house lights will save you 29.58 kWh a year, and the same money spent on CFLs would save you a whopping 1,499 kWh a year. So unless you have already converted all your incandescent and halogen light bulbs to energy saving light bulbs, this energy efficient toaster doesn’t sound like a high priority investment. And if you do leave the toaster plugged in all the time, that 12.85 kWh saved becomes only about 4 kWh. That’s a pretty small annual savings for a $50 investment. The toaster is a full-feature energy efficient toaster, including the usual fancy features such as bagel toast and defrost. It also has a motorized carriage to lower the toast slices into the toaster. This to me is one of its big disadvantages. The beauty of the traditional toaster is that it has very few moving parts other than the push-down carriage, and very few controls; this is why some toasters made in the 50’s are still in operation today. A motorized carriage sounds like a breakdown waiting to happen – especially with all that heat being trapped inside the toaster to wear the motor down faster. Disadvantages of the toaster include the fact that you can’t see your bread toasting; extra long slices of toast won’t fit in it (for example, the ones that come out of my tall-loaf breadmaker); and the fact that it is activated by an electronic button, which makes it easy to accidentally start the toaster running, if some other object on the counter bumps up against it. Overall I would be wary of this energy efficient toaster unless you do an awful lot of toasting. Its two-year warranty is pretty short considering good-quality toasters should last 20+ years. If you really want an energy efficient toaster, you may just want to try covering your toaster with a cookie sheet. That certainly works for me! This toaster appears to be a repackaging or redesign of the Ecolectric, and I suspect the benefits of buying it are mostly on the aesthetic or functional side; you will be hard pressed to earn back your $70 investment in energy savings. Most indicator LEDs consume less than 0.05W. Where did you get 1W for your estimate of 8kWH for an LED left on constantly all year? That’s about 20x too high. Actual LED consumption is closer to 0.4kWH, and high efficiency LEDS can reduce that by another 10x. There are many misconceptions about energy consumption. I think it’s important to correct gross errors like this so that people don’t begin telling each other that every LED consumes 8kWH per year until it becomes a “fact”. The point is that people need to put their “energy” into saving energy in the right places. Replacing your incandescent or fluorescent home lights with LEDs will save vastly more power than choosing not to buy a toaster that has an LED indicator on it. The power consumption for an LED is indeed negligible, but the power consumed by its voltage step down mechanism is not! You may need to re-check. I don’t have one of these toasters with LED light to check, but every time I’ve measured a device that is plugged in but not operating, and has a single LED light, the power draw is too low to register anything at all on my Kill-A-Watt Meter. If anyone has one of these toasters and a Kill-A-Watt or equivalent, feel free to do a measurement and post it here.